Originally from Anxi province (安溪县) in China, Tieguanyin (铁观音) is one of the most famous styles of Oolong tea and makes the list of “China Famous Tea” (中国十大名茶). Today Tieguanyin is available from several other provinces, and many of the best Tieguanyin also comes from Taiwan. Very high grades of Tieguanyin can fetch extremely high prices, second in price only to Dahongpao (大红袍), but fortunately good quality Tieguanyin can still be found at a reasonable price for the everyday tea drinker. Good quality Tieguanyin will often have an orchid-like aroma. The flavour is smooth and mild, with the characteristic “sweet aftertaste” or houyun (喉韻). An entire article could be written on houyun, but suffice it to say that a good Tieguanyin will leave a pleasant aftertaste in the back of the throat. The leaves of Tieguanyin are lightly oxidized and will be rolled into small balls that unfurl into a full leaf when steeped. You may also find Tieguanyin called “Iron Goddess,” or “Iron Goddess of Mercy.” This unusual name comes from a literal translation of the Chinese “铁观音” which is a reference to Guanyin, the Buddhist bodhisattva, or enlightened being, associated with compassion. 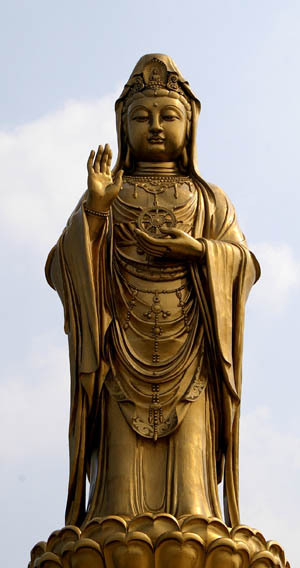 Guanyin originates from the Sanskrit name Avalokiteśvara (अवलोकितेश्वर), often called the Goddess of Mercy in English. It isn’t known for sure where the Tie, or “iron”, part of the name comes from, but legend has it that an iron statue of Guanyin looked over the town in Anxi where Tieguanyin originates. One thing I’ve noticed about Tieguanyin is that people just can’t seem to get the romanization (“English” spelling) correct or consistent. The proper pinyin romanization for Mandarin Chinese is Tiěguānyīn, and “titgūnyām in Yale Cantonese (tit3gun1jam1 in Jyutping). I’ve seen this spelled as everything from “Tea Kwoon Yang” to “Tiet Kwun Yum” to the slightly less wrong “Tie Quan Yin” and everything in between. Keep an eye out for strange romanizations of this one at your local tea shop or café! 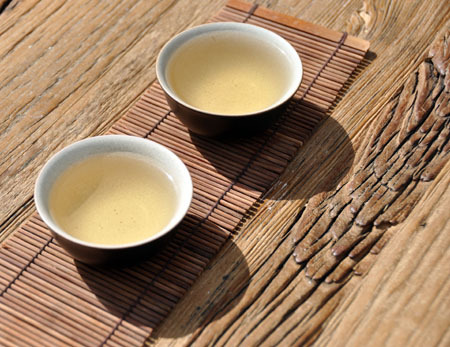 Tieguanyin should be steeped at a relatively high temperature for Oolong tea, at 90-95°C (195–205°F; String of Pearls). But if your first attempts come out too bitter, try decreasing the water temperature a bit. Hopefully this gives you a taste of one of the great oolongs of China. Remember that you can re-steep the leaves of Tieguanyin at least 5 or 6 times: try using a small pot to steep just one cup at a time, or use a Gaiwan. Most importantly, enjoy! This entry was posted in China Famous Tea, Featured Teas, Oolong by tea. Bookmark the permalink.